General Horemheb is confident of becoming Pharaoh when Ay dies childless. Over-confident? He understands men. But not, alas, women, who are as unpredictable and disobedient as cats. The gods, possibly offended, challenge him with plots, pretenders, disappearances, assassins, magic, and willful women–not to mention an imperious kitten who rides his shoulder and whose goddess he had better not offend! 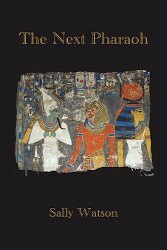 Becoming the Next Pharaoh turns out more complicated than he had supposed!